In 1767 an Act was passed enabling the highway between Isleworth and Teddington through Twickenham to be designated a Turnpike Road. The road would be a branch of the Turnpike between Kensington and Staines which had come into being in 1717. At first the road terminated at the southern parish boundary of Teddington. Later, it was extended to join the road from Kingston to Hampton and so through as far as Sunbury. The name "turnpike" derived from the design of early barriers used at entrances and exits where tolls were charged. These swinging bars were later substituted by gates. Toll houses for the keepers were sometimes built by the roadside but there do not appear to have been any here. Management of the new Turnpike was by a committee of 26, composed mainly of adjoining landowners anxious to protect their own riparian interests. The committee met regularly and the names of those attending are recorded in the minutes. "...From thence (Twickenham) to Cross Deep the road tho' narrow is good and can nowhere be widened on account of buildings and gardens inclosing it on each side...At Cross Deep the road lies extremely low and is frequently liable in the Winter to be dangerously overflow'd from the Thames which can no way be remedied but by raising the road to a considerable heighth (sic) above the present level from the high ground on the Twickenham side to about or rather more than 100 yards up the lane and turning a capacious arch under the road..."
This crossing at the stream had for long been a difficulty for traffic, especially in winter and the committee minutes record problems and solutions for a number of years. In 1697 Richard Bowery, father of Alexander Pope's boatman had drowned here. Eventually the stream was put into a culvert and the land raised to the level it enjoys today. 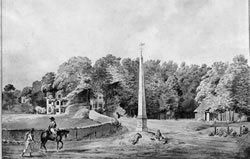 Here the junction with the start of Strawberry Vale and Waldegrave Road was marked by an obelisk with a weather vane and directions for travellers. Strangely, the provision of this obelisk, of which there is more than one 18th century view is not recorded. Nor is its removal. Some adjoining owners became too pro-active for the committee. It was reported on 26 June 1779 that the "Rev Mr Stretch at the Academy in Twickenham (had) made a foot pavement across the road to his house to the great annoyance of passengers in general...Ordered that it be immediately be taken away". However, all had been forgiven by the following March when Mr Stretch was elected a committee member following the death of Thomas Ripley. The Reverend Liscomb Maltby Stretch was running a small private school at Bath House in the London Road, just next to where the Cabbage Patch Public House stands today. In 1771 Stafford Briscoe at Cross Deep House had enjoyed better fortune than Mr Stretch: he was given permission to pave the road between his house and his riverside garden to create a footway. 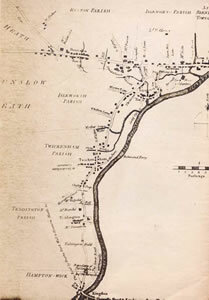 The Trust continued until 1827 when all 14 Trusts in the metropolitan area north of the Thames were taken over by the Commissioners of Metropolitan Turnpike Roads. Many of the trusts were in debt but here the trustees were in profit and were able to pay over a balance of £27-16s-9d.